Summer@Stratford offers a balance between traditional learning, STEAM enrichment, and creative fun. Keep the adventure of learning going throughout the summer with an innovative, customizable summer camp experience at Stratford School. 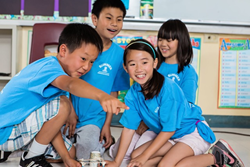 Stratford’s traditional Camp Socrates, offered at campuses throughout the Bay Area, offers a fun and engaging approach to an enriched academic summer learning program. An “a la carte” summer program, offered at select campuses, provides campers with the opportunity to create their own learning experience based on their specific interests and needs. Both programs revolve around Stratford’s STEAM (science, technology, engineering, art, math) focus. Camp Socrates has options for Preschool through 5th grade. The Preschool through Pre-K programs set the stage for fun adventures in learning. Themes come to life as junior campers learn, explore, and engage in imaginative camp-style activities. In the Kindergarten through 5th grade programs, the day begins with team building and camp play. Morning sessions engage the mind with creative and interactive reading, math, and writing activities that promote critical thinking and strengthen fundamental academic skills. Stratford’s innovative a la carte program, available at select campuses, gives 1st through 9th grade campers the opportunity to explore their passions and discover new subject areas. This program offers flexibility to enjoy a variety of STEAM and enrichment activities. One week a student could be designing and building a roller coaster. The next week they could be commanding a space ship, writing music on a tablet, or perfecting their skills on the basketball court. Focusing on developing a lifelong love of learning, boosting confidence, and increasing team-building skills, Summer@Stratford provides new and exciting opportunities for children in every age group. From engineering to art, math to creative writing, all camps incorporate Stratford School’s STEAM curriculum with a fun, new twist. Registration is now open. Programs begin on June 20th. For more information visit: http://www.stratfordschools.com/summer-camp. Established in 1999, Stratford School is a leading independent private school founded on the belief that education is a significant influence in the life of a child. Stratford offers an accelerated curriculum from preschool through eighth grade with an emphasis in the areas of STEAM (Science, Technology, Engineering, Arts, and Mathematics) that incorporates music, physical education, foreign language, and social skills development. Stratford’s goal is to prepare and mentor students for admission to competitive high schools and colleges. All students are provided the necessary tools to excel, and are encouraged to participate actively in leadership, community service, and extracurricular activities. Visit http://www.stratfordschools.com for more information.